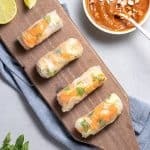 Vietnamese Tofu Spring Rolls! 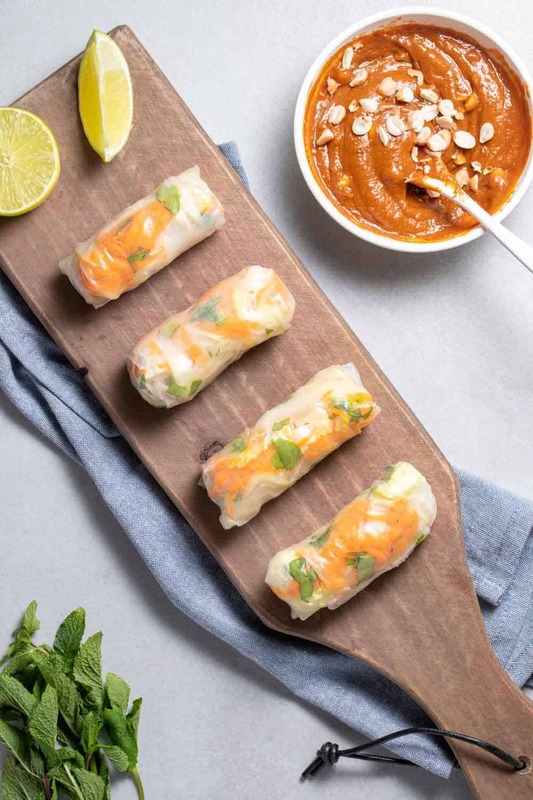 You will love these healthy salad rolls, stuffed with crispy peanut tofu, shredded cabbage, carrots, mint, cilantro and vermicelli noodles. Served with a spicy peanut-lime dipping sauce. 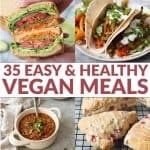 Vegan and easily gluten-free. Is Spring actually here? Temperatures hit the mid-6o’s this weekend, the perfect excuse to drop what we were doing and bask in the Spring glow. We put out our patio furniture, turned on the grill for the first time and pretended- just for a moment- that we were back in California, enjoying an impromptu cookout on our deck. Though it started raining the very next day, I wanted to keep my bright mood going with these fresh spring rolls. I really need to make these more often. They are so effortless to put together and are the perfect light meal when I’m still craving big, bold flavors. I associate fancy family dinners with Vietnamese food, which is an odd statement to say the least from an Danish/Italian child who grew up in the South. While my mom was a fantastic cook, she didn’t know her way around an Asian kitchen. So, on very special occasions (like good report card days), we would head out to to neighboring town’s Vietnamese restaurant and order like kings. In the 10+ years of going there, I’m fairly certain I ordered the same thing every time: a Shirley temple with extra cherries, spring rolls and the vermicelli bowl. I don’t know if it’s really as good as I’ve imagined or time has made it that way, but I remember feeling so fancy wolfing down my oversize bowl of thin noodles, shredded vegetables, pork and the best spicy peanut sauce. Every bite of these spring rolls is in tribute to that meal and those memories. While I think spring rolls are fairly easy to assemble, you’ll want to have all of your fillings chopped and ready to go ahead of time. You can save time by using pre-shredded cabbage and carrots, or swapping in whatever vegetables you have on hand. I think red bell peppers would also taste great in these rolls! Use a damp paper towel for lining the prepared rolls so they don’t dry out and crack. They taste best when enjoyed right after making! Once you’ve rolled the your Spring rolls, enjoy any leftover filling and sauce like a salad. Like most things around here, please accept my liberal interpretation of Vietnamese cuisine. I made these rolls out of what I remembered that meal to taste like, not any authentic version. But, it really doesn’t matter. They are so good, so meaty and so filling that my food memory can easily become your food memory. Vietnamese Tofu Spring Rolls! You will love these healthy salad rolls. Spring Rice Rolls stuffed with crispy peanut tofu, shredded cabbage, carrots, mint, cilantro and vermicelli noodles. Served with a spicy peanut-lime dipping sauce. Vegan and easily gluten-free. Whisk together all ingredients for the peanut-lime sauce and set aside. Drain and press the tofu. Heat a large cast-iron or non-stick pan over medium heat. Slice the tofu into slabs so they can lay flat on the rice paper rolls. Place the tofu in a single layer on the skillet and cook for 2-3 minutes until golden brown. 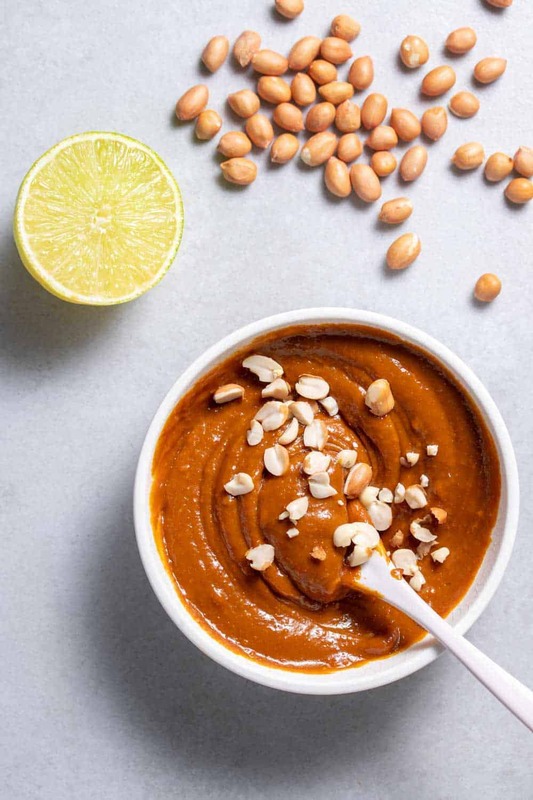 Remove from skillet and brush peanut sauce in a thick layer on one side. Prep the vegetables, tofu, and noodles. 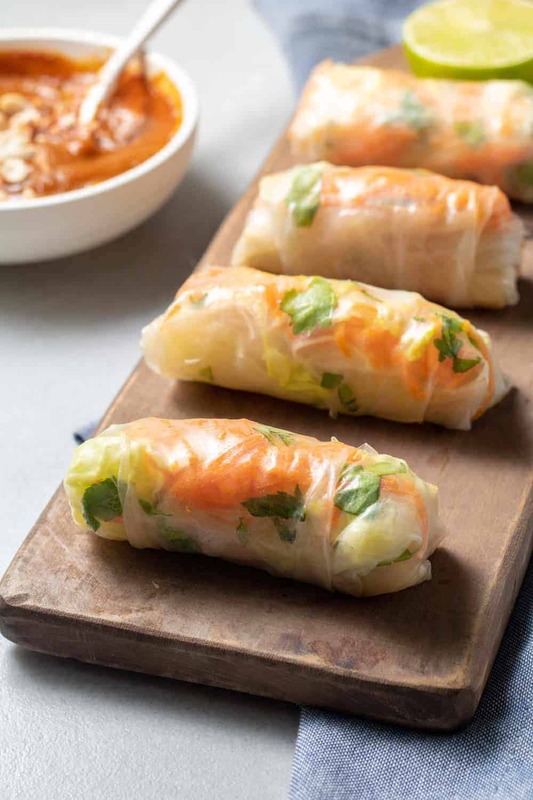 To assemble spring rolls, pour very hot water into a shallow dish and place 1 rice paper to soften for about 10-15 seconds. Move to a cutting board and spread out into a circle. It’s OK if it rips a little but if it rips too much, get a new one and start again. Place seam-side down on a serving platter and cover with damp warm towel to keep fresh. Repeat until finished, you should have about 12-15 spring rolls total. Serve with remaining peanut-lime sauce. Leftovers store well individually wrapped in plastic wrap, though taste best when fresh. 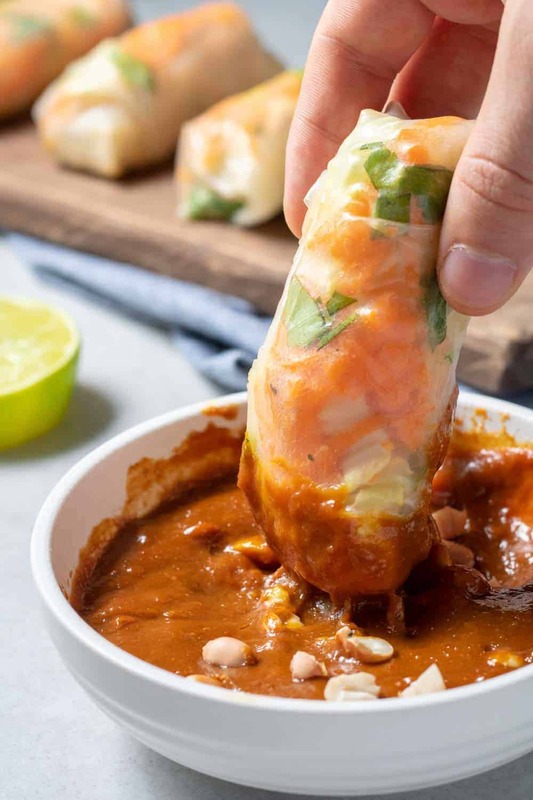 I love rice paper rolls and these look incredible! Especially with that dipping sauce! In step 6 when you say prep the vegetables, what does that mean? Cook them? It means cut them and have them ready to go so the assembly is easy. Love hearing that you like this recipe so much, thanks Fran! Oh my goodness! 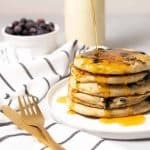 Finally found a vegan recipe that my husband said he would like again! Thank you! So glad you liked it! Thanks Denise! I love these! They are so good, but I stink at rolling them. Thank you!